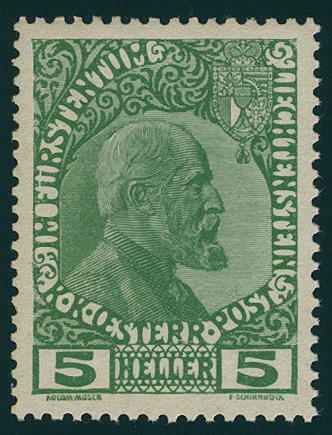 3866 1/3yb Prince Johann 1912 on normal paper, all three values fresh colors and very well perforated, in perfect condition mint never hinged, without any signs. Photo expertize \"mint never hinged perfect\" Marxer BPP. 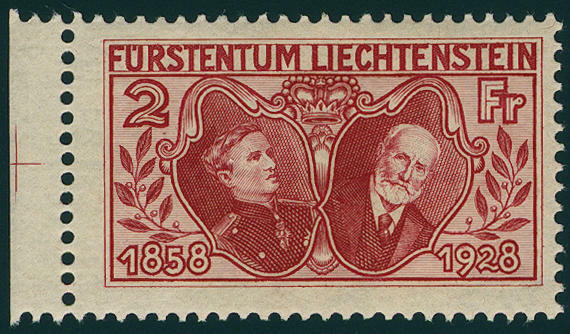 3867 IA 15 H. Blackish rose red, the scarce not issued value perforated, fresh colors, in perfect condition unused with tenuous trace of a hinge. Photo expertize Rupp. Michel 950,- €. 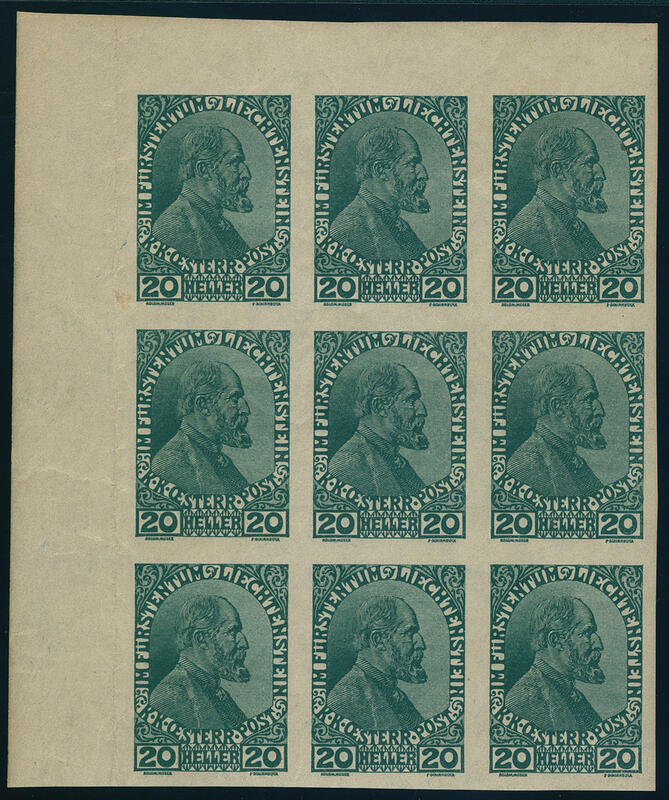 3868 8U 20 lighter dark green, issue 1918, wonderful block of nine from the left upper corner unperforated, fresh colors and with wide margins, slight embossed spots, one stamp small adhesion point. 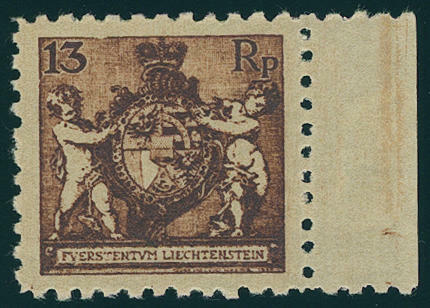 An especially decorative and scarce unit! Photo expertize Marxer. Soviet Zone 2000,- Sfr. 3869 / 12I 1 Kr. 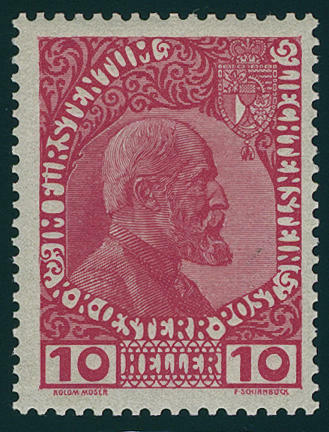 On 10 H. Dark magenta, block of six with partial missing overprint (by of the right lower stamp almost even missing), through sheet fold, mint never hinged, a value clean trace of a hinge. 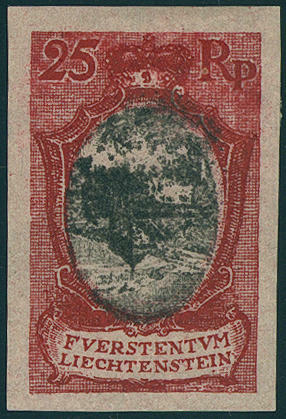 Very interesting and scarce unit, in this kind possibly unique! 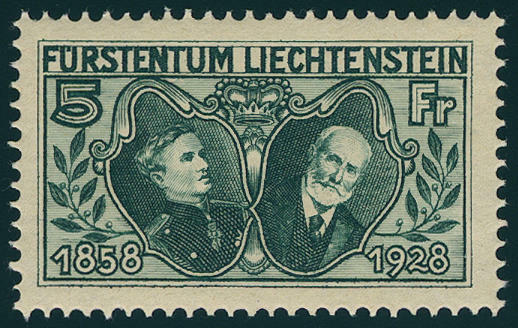 3870 40/42S Birthday 1920, unperforated black print series, a value trace of crease, otherwise in perfect condition on ungummed paper. Michel 240,- €. 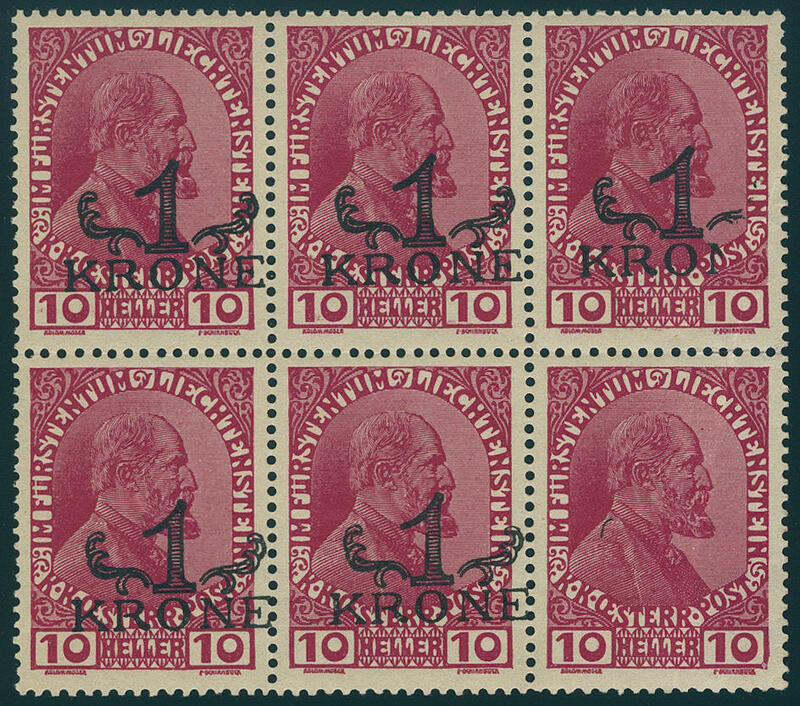 3871 45/52A Postal stamps 1921, all eight values with rare far perforation, fresh colors and very well perforated, in perfect condition mint never hinged, photo expertize \"mint never hinged perfect\" Marxer BPP. 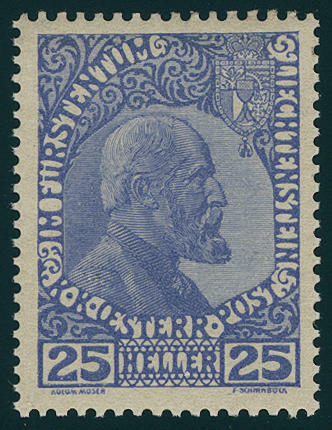 3872 54PK 25 Rp. 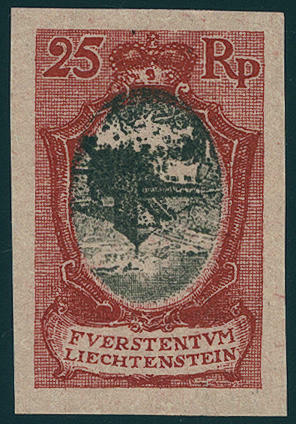 Dark red / green black with inverted centerpiece from upper margin, in perfect condition on ungummed paper, unperforated, in the margin of sheet is an inverted half centerpiece to see. Especially attractive and rare in this form! 3873 54PK 25 Rp. 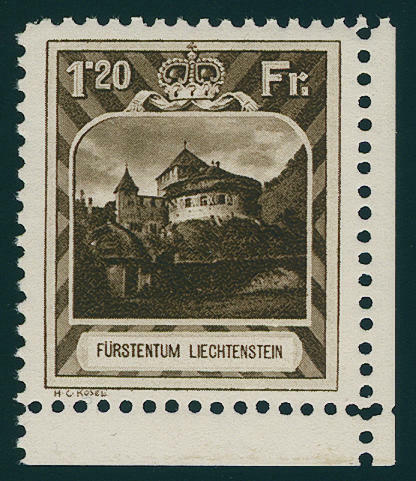 Castle Vaduz 1921, unperforated proof in the original colors with inverted centerpiece, in perfect condition on ungummed paper. Rare! 3874 54PK 25 Rp. 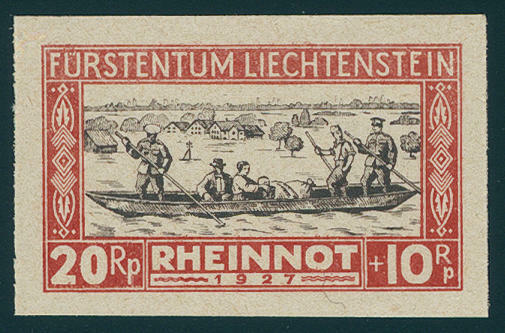 Dark red / green black, unperforated proof with inverted centerpiece, in perfect condition on ungummed paper. Rare! 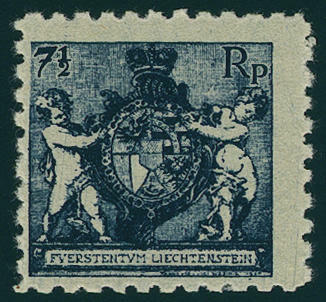 3875 57P1 40 Rp. 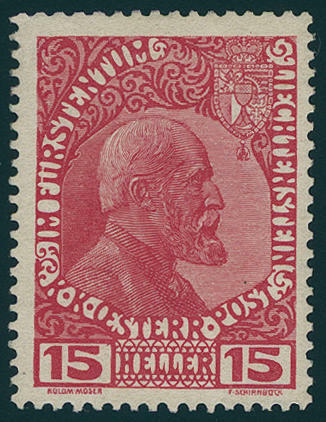 Church in Schaan, unperforated proof in brown red / black block of four, in perfect condition on ungummed paper, from left margin of sheet. 3876 57U 40 Rp. 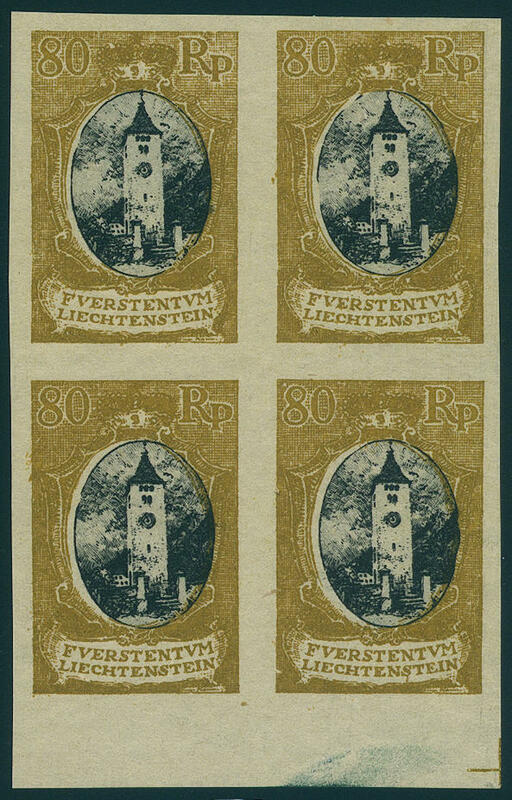 Church in Schaan 1921 unperforated block of four, in perfect condition mint never hinged Michel 360,- €. 3877 59P3II 80 Rp. 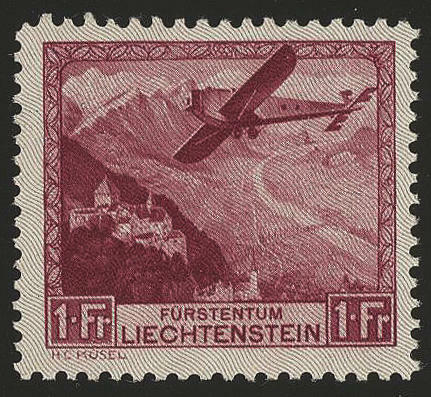 With wrong centerpiece, unperforated proof in yellow brown / black, in perfect condition on ungummed paper block of four from lower margin. 3878 60P1 1 Fr. 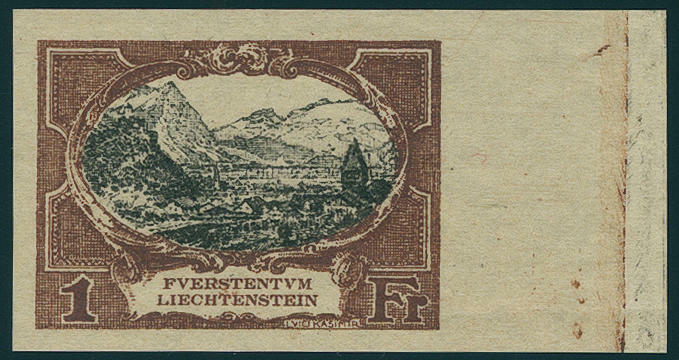 Rhine valley by Vaduz, unperforated proof in brown / black, in perfect condition on ungummed paper, from right margin of sheet. Rare! 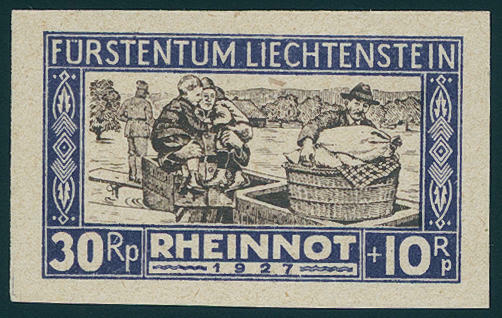 3879 78/81U Rhine need 1928 unperforated in slightly different colours, fresh colors and in perfect condition mint never hinged a scarce set! Certificate (copy) Rupp. 3880 82/89 70. 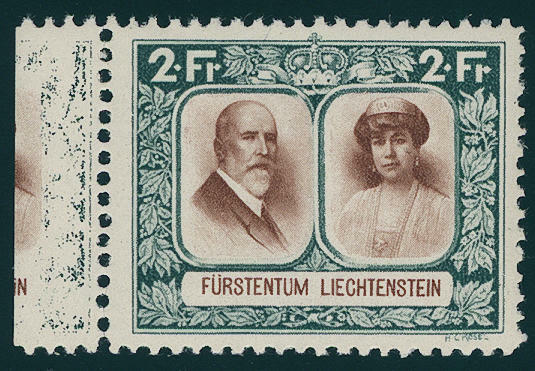 Anniversary the throne ascent 1928, all eight values fresh colors and very well perforated, in perfect condition mint never hinged, without any signs. Photo expertize \"mint never hinged perfect\" Marxer BPP. Michel 1300,- €. 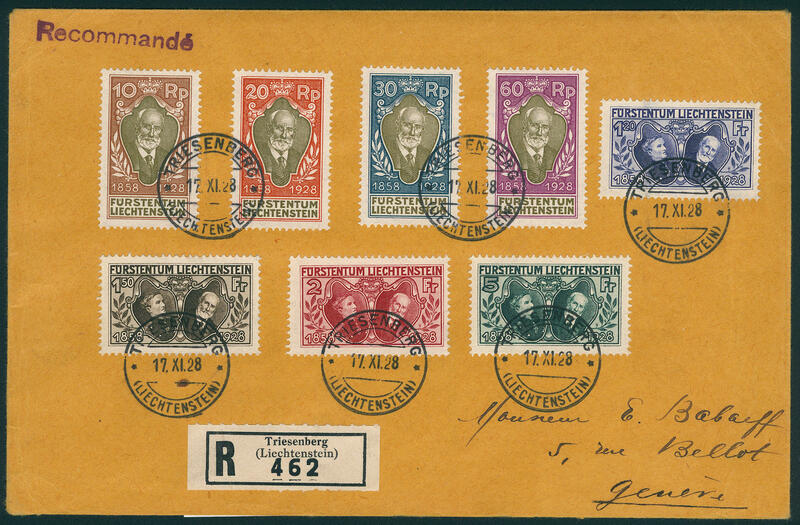 3881 ✉ 82/89 Regency 1928, the complete set from eight values fresh colors and very well perforated, in perfect condition on very nice registered cover from \"TRIESENBERG 17. XI. 28. 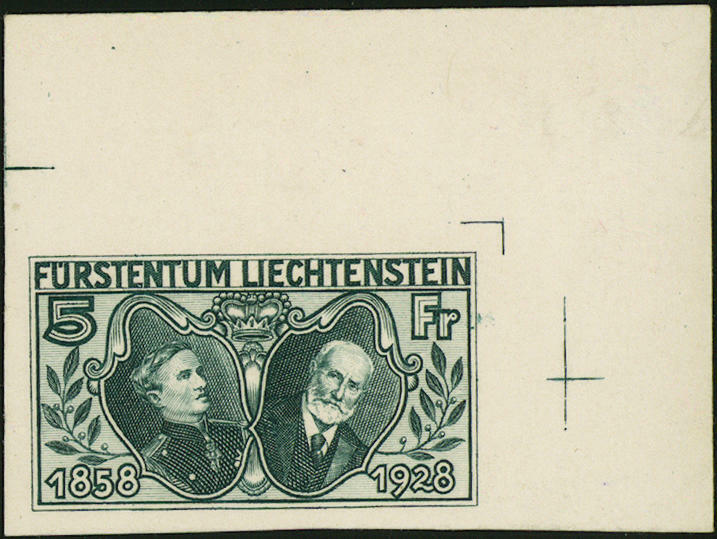 \" to Geneva / Switzerland with arrival postmark. 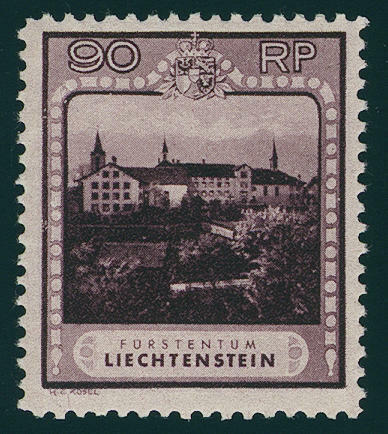 A Honor for the sophisticated Liechtenstein collection! 3882 ✉ 86,88/89 1, 20 Fr., 2 Fr. And 5 Fr. On very nice phil. 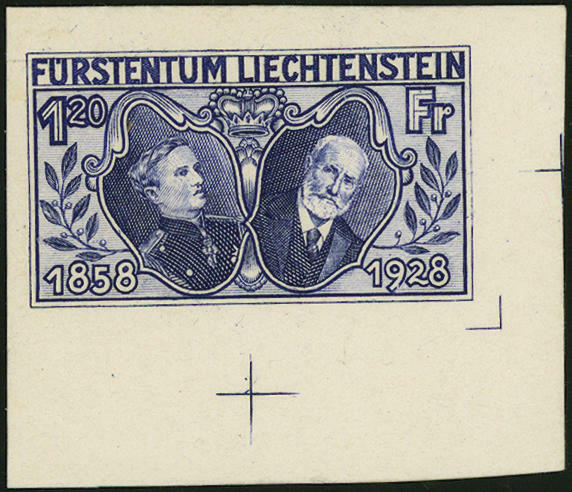 Registered cover from \"SCHAAN 10.1.29. 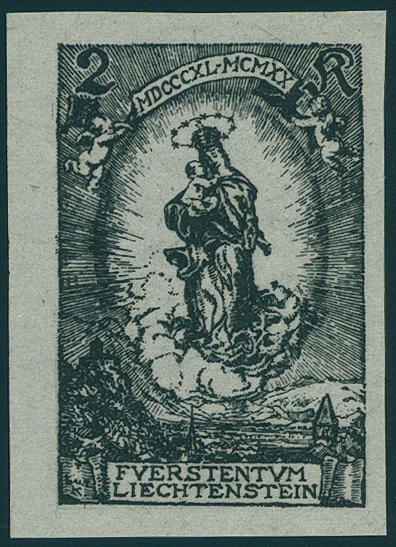 \" to Boncourt with arrival postmark. A wonderful cover in first-class condition! 3883 86/89P1 1, 20 - 5 Fr. 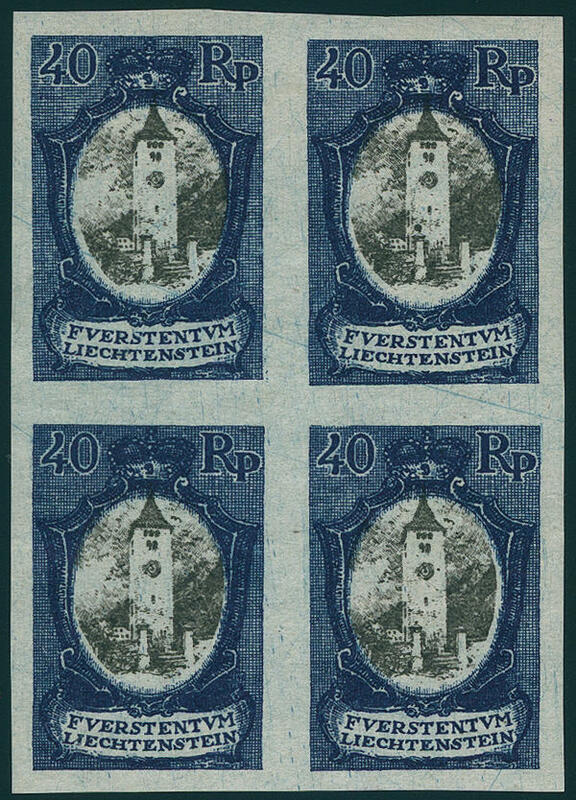 Regency 1928, all 4 values as trial proofs in the original colors, in perfect condition on ungummed cardboard paper, unperforated, as well 2 values from corner margin with marker cross on margin to facilitate cutting or perforating of panes. Very rare! Michel 900,- €. 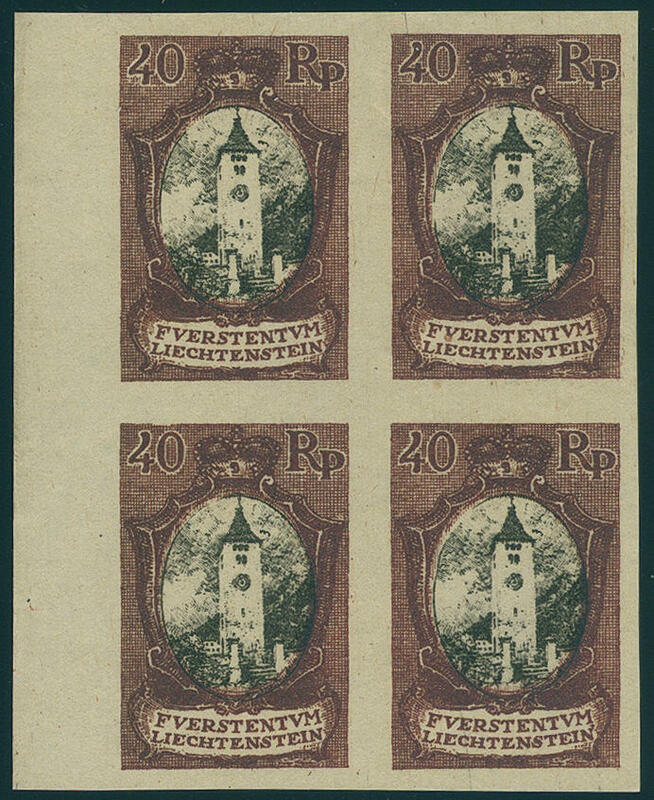 3884 94/107 Postage stamps set landscapes and Prince and Princess 1930, all 14 values fresh colors and very well perforated, in perfect condition mint never hinged, without any signs. Photo expertize \"mint never hinged perfect\" Marxer BPP. Michel 2200,- €. 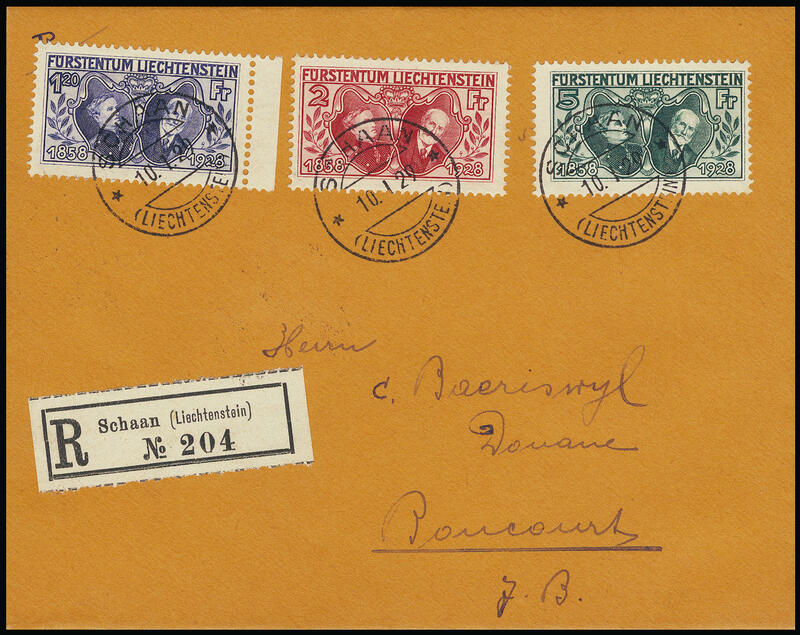 3885 108/13 Airmail set 1930, fresh colors and in perfect condition mint never hinged without any signs, photo expertize Liniger. Michel 640,- €.